Chay River – Dark Cave appears in a strange jade green, merging with the green of the forest and imposing limestone ranges. Along the river banks are immense corn fields. All come together to create such a magnificent and poetic picture. 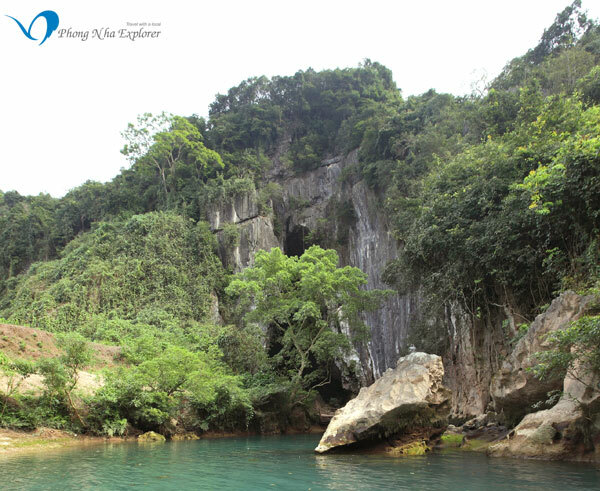 If you like trips of adventure, Chay river – Dark cave lying in system of National park of Phong Nha – Ke Bang is a suit destination. Coming to Chay River – Dark Cave, Visitors will enjoy a 400m zip-line from the wildlife observation tower to Dark Cave by equipment dedicated for explore cave as headlight and helmet. Chay river with clear and blue water mixtured with forest and limestone moustain cliffs creates a wonderfull and extreme beautifull picture. 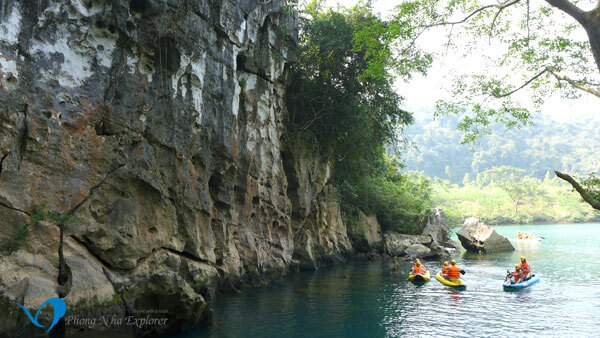 Come here, adventure prefer visitors can jump down from zipline to plunge into fresh water, join underwarter game or boating kayak to sightseeing lovely scenery. Boating along Chay river about 5 km, you will reach to Dark cave. With stalactites lines overflows in 2 side of cave gates making Dark cave get a extreme impressive scenery. Due to sitting next to Chay river with hight wet, so stalactites at Dark cave covered with a big moss, creat a magical blue. Stepping into cave, dark shadow covering everywhere making moving inside cave became spectacular. 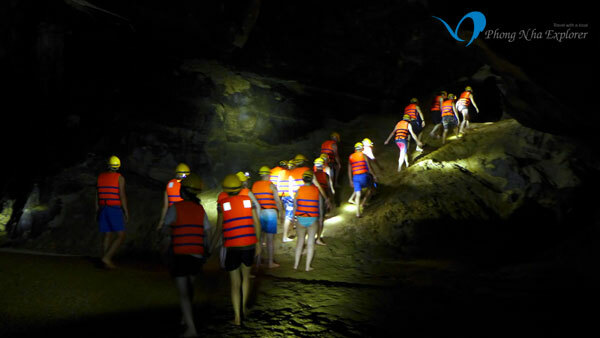 Chay River – Dark Cave about 50 kilometers from Quang Binh Province’s Dong Hoi City in the central region, the Chay River and Toi (Dark) Cave are an exciting destination for those who love adventurous activities. In the middle of a giant limestone, the mouth of Toi Cave appears mysteriously. Like what its name suggests, the dense dark covers up every corner of the cave, making it difficult for tourists to move inside the cave. Tourists will find themselves indulge in a cool climate due to the flow of an underground section of the river, and the only light from the torch hung on the forehead will lead the way for tourists to explore and contemplate fossils in various shapes on the cliffs. 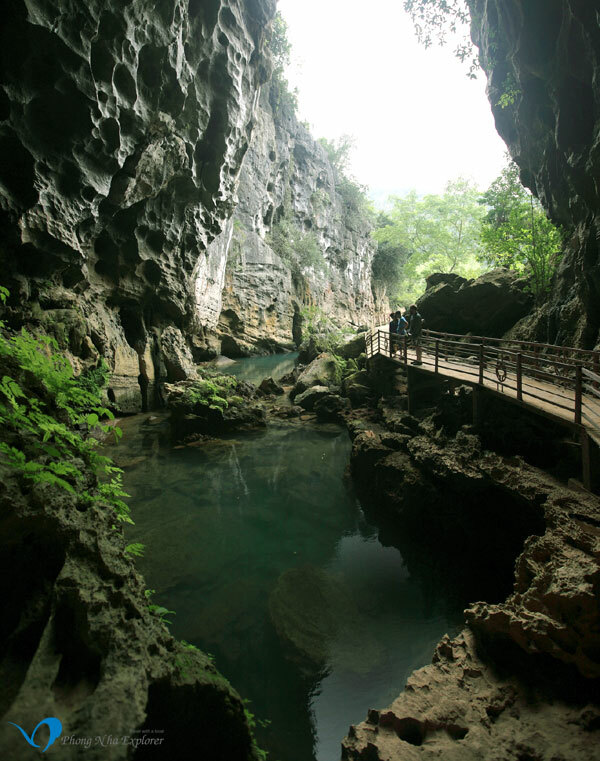 In order to reach Toi Cave, apart from hanging in the air on the 400-meter-long zip line system, tourists have to cross the river and wade through the mud. Chay River – Dark Cave: There, tourists can jump down from the zip line to dip themselves in the crystal green water and swim to Toi Cave. 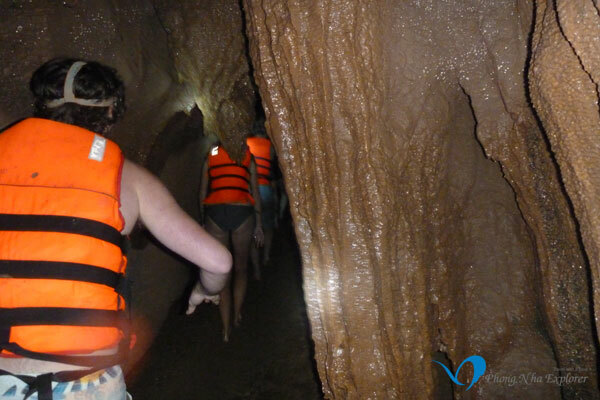 Tourists can also choose to flow along the river on kayak boats and take part in water activities before continuing the journey to explore Toi Cave. Dark Cave, a narrow slot in the cave with mud and stalactite on the cliffs will bring tourists the most interesting challenge. It was at the end of this road that tourists will face a mud pit and experience the complete quiet space, in which the only sound that can be heard is the sound of water dropping down on the mud surface from the cave’s roof. 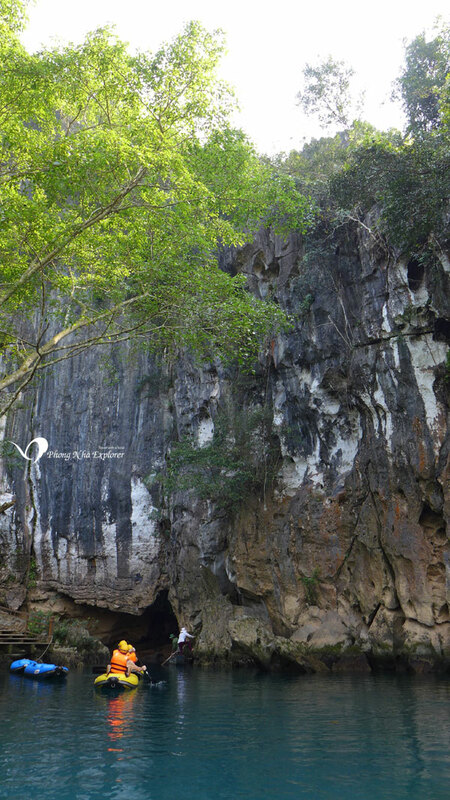 The journey to the Chay River and Toi Cave also brings tourists to Thien Duong Cave with its beauty described as a water-color painting by nature, as well as the historical relic site of Tam Toa church, the grave of late General Vo Nguyen Giap and Tam Co Cave.